I remember the days of my childhood when birthdays were such a big deal. I would countdown with great anticipation for my big day. I could not wait for the party, the cake, the gifts, the friends. 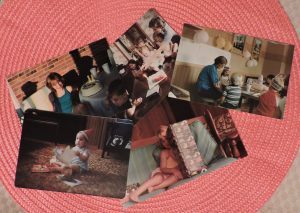 I remember looking at pictures from my first birthday of me sitting on top of the dining room table in front of a Raggedy Anne cake. My third birthday was celebrated with my friends and I sitting at the big oval shaped table in the back of McDonald’s. My fifth birthday at the beach, the costume party I had when I turned nine and the pool party when I turned eleven all bring back fond memories of my childhood. But, at some point, probably my early twenties, birthdays became less exciting. I still looked forward to a little extra attention, just not with as much anticipation as when I was younger. I recently celebrated my 39th birthday. Thirty-nine seems so unbelievable, yet so exciting. In the few weeks leading up to this birthday, I have spent a lot of time reflecting on how different my impending birthday felt five years ago. In all honesty, five years ago I really didn’t care if thirty-four came. That fact is hard to admit, but so very true. 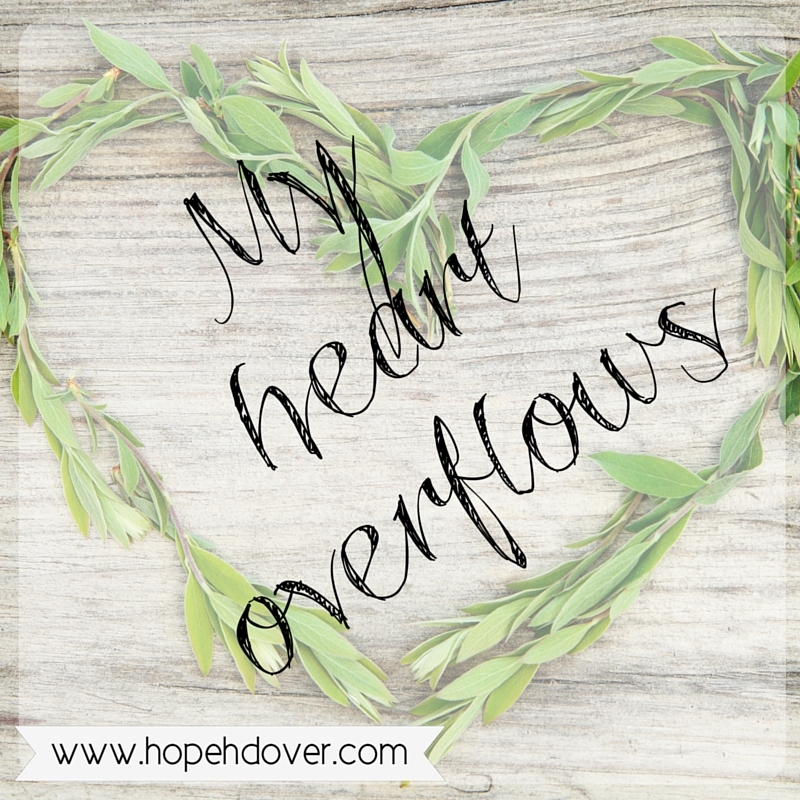 Five years ago, I was consumed – by grief, by questions, by depression, by heartache. All of it unrelenting. All of it got worse before it got better. I understood none of what was happening and struggled to see my purpose for being. Many days, simply getting out of bed and moving to the couch was an accomplishment. Today I thank God for the seeds planted from infancy that there is a God who loves me. I thank God for family and friends (and even strangers) who fought for me on their knees in prayer because that was the only way they could reach me. I thank God for a husband who didn’t give up on me even though he was at a loss for how to help. I thank God for a Mama who called me every single day and insisted upon taking me out to lunch and on shopping trips and forcing me into doing a bunch of other things I really didn’t want to do. I thank God that my thirty-fourth birthday came. Thirty-four had to happen so thirty-five could happen, although those years brought more pain and heartache. Without thirty-five, I couldn’t have reached thirty-six and the arrival of my sweet Samuel. Thirty-seven brought precious Emma Joy to complete our family. Thirty-eight brought the healthiest year of my life, but not without bouts of depression, feelings of rejection and more questions of why. All of the struggles I had at thirty-four are still here at thirty-nine. I still grieve. I still question, just not as often. I still struggle with depression and anxiety, although I’ve found healthy ways to fight them off before they consume me. And my heart still aches every single day when I think of my sweet babies in heaven and wish they were here. What’s different now is an even more deeply rooted knowledge that God loves me fiercely (Ephesians 3:17-19) and has great plans for me (Jeremiah 29:11), even when I do not understand. What’s different now is a closer relationship with the One who formed me in my mother’s womb all those thirty-nine plus years ago (Psalm 139). What’s different now is an eternal perspective rather than an Earthly one (Colossians 3:1-2). 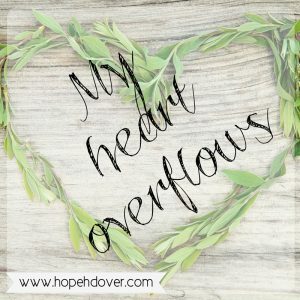 God has been gracious and merciful and pulled me out of the pit more times than I can count. I am now at a place where I can look back and see that He was with me through it all. When I think about all that has happened in my life, especially the past five years, I am still unable to say why it had to happen the way it did. I just know that it had to happen and resting on that knowledge is enough for now. I have a feeling that when I get to heaven and look back at the entirety of my life the why won’t even matter anymore. Without thirty-four, there could not be thirty-nine. So, what’s in store for thirty-nine? Only God knows for sure. I know there will be ups and downs. I’m sure I will still struggle with everything I struggled with five years ago. At thirty-nine I want to move out of surviving to thriving. I want to love the people God puts in front of me like Jesus loves them. I want to be a light in the darkness; a woman on fire for Jesus. And I want to help others keep hoping despite what life brings. I’m not exactly sure what any of that looks like right now, but I know He will be with me every step of the way. Raise your hand if your life has gone perfectly as planned. You are right where you expected to be by this point in time and you got to this place in the exact way you imagined it would happen. There have been no forks in the road, no u-turns, no dead end streets – just a straight path to a blissful life. Life rarely goes as planned and we rarely get from point A to point B in a straight line. Instead it is filled with bumps in the road and turns we never expected. Sometimes it may even seem that the road has disappeared completely. When things do not go as planned it can be so easy to get caught in the “it’s not fair” mentality. Life’s struggles can make us question our very existence. Is it possible to love life when bad things happen? Can there really be purpose in the pain? 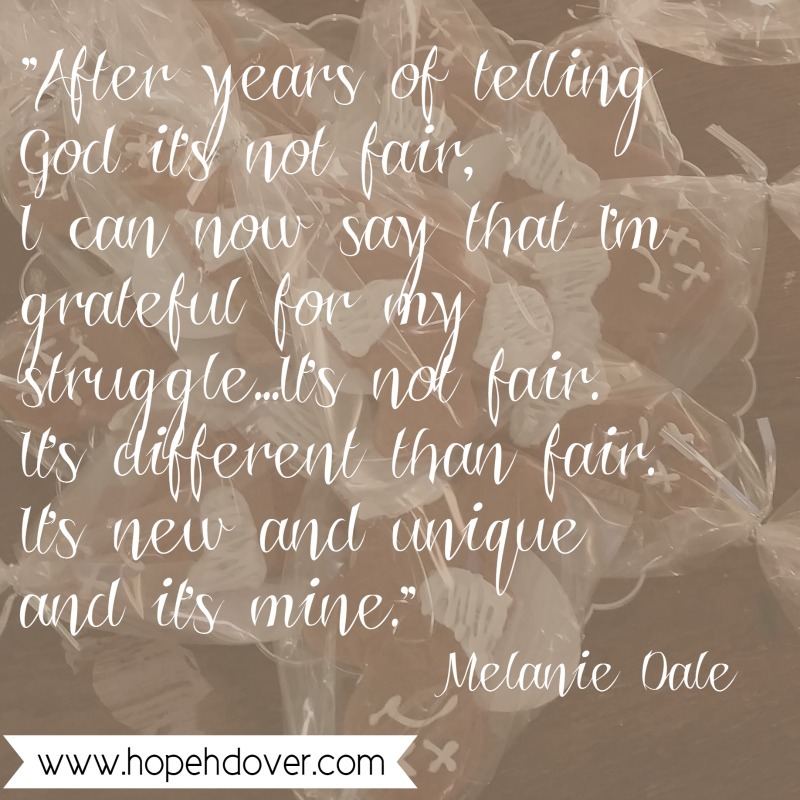 Is there a way to be grateful for our struggles? 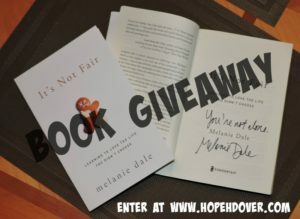 The best part about this book is that Melanie does not take life’s unfairness, tie a big bow around it and tell us that everything is going to be okay. Instead, she comes alongside us in our suffering and shows us that we are not alone. Reading It’s Not Fair: Learning to Love the Life You Didn’t Choose is like sitting down and having a deep conversation with your best friend. So grab a fuzzy blanket and get ready to laugh, cry and maybe scream, “it’s not fair!” Yes, life is not fair, but we can choose to embrace the never-ending process of loving it anyway. 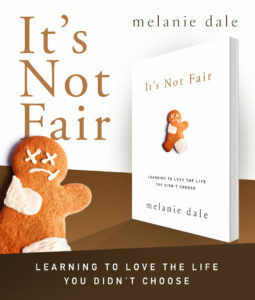 I had the pleasure of attending the launch party for It’s Not Fair: Learning to Love the Life You Didn’t Choose this past weekend. I snagged two signed copies of the book and I want to share them with two special readers. Enter the giveaway between now and next Tuesday. The winners will be announced next Wednesday. 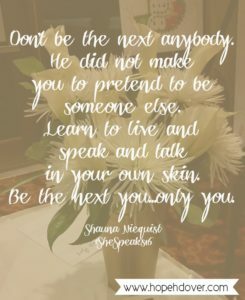 Last month I attended the She Speaks conference in Concord, NC. 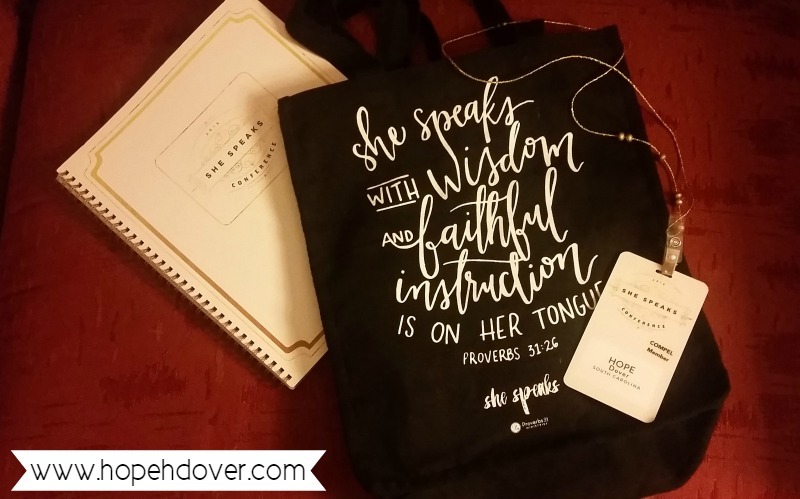 Hosted by Proverbs 31 Ministries, the conference was started 15 years ago by Lysa TerKeurst. She wanted to provide aspiring writers, speakers and ministry leaders help that she did not have when she got started in ministry. The conference provides main sessions that include a time of worship, breakout sessions, networking opportunities and the option of one-on-one appointments with literary agents and acquisition editors from publishing companies. This was my third year attending the conference. I have learned a lot from the breakout sessions, but I have gotten so much out of the main sessions as well. 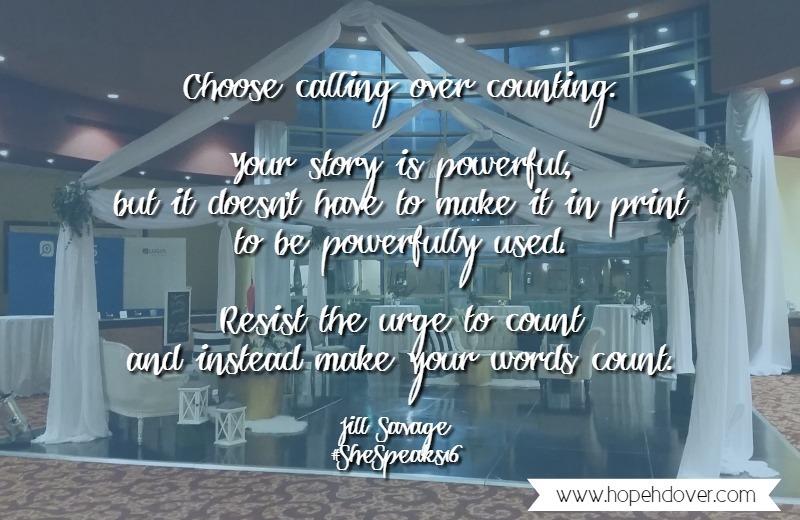 Over the years I have had the opportunity to hear some amazing speakers – Christine Caine, Liz Curtis Higgs, Shauna Niequist and Lysa TerKeurst, just to name a few. And there is something powerful about 800+ women worshiping together. 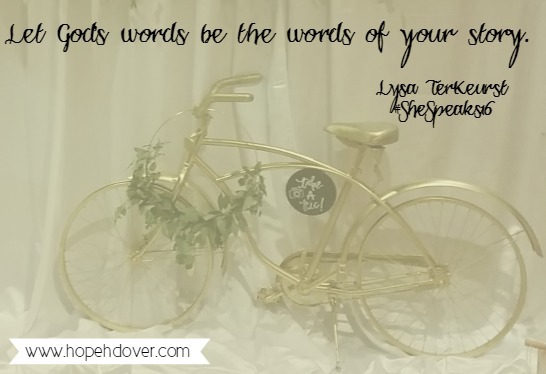 The atmosphere is electric as everyone wants to know about you – your writing, your speaking, your ministry. While there last week, someone asked me why I keep coming back each year. My answer is that I honestly get something different out of it every year. The first year was a bit overwhelming as I went by myself, not knowing anyone there. Let’s face it, women can be scary. And 800 women in one place was even scarier for this introvert. Then, during a break at the pre-conference, one of these women struck up a conversation with me. We talked about what I write about, my losses, my struggle with infertility and my pregnancy with Samuel. (I was almost out of the first trimester at that time.) Then she prayed with me. It was so refreshing and put me at ease about the weekend. Later that day God orchestrated this meeting and one of the most amazing moments of prayer I have ever experienced. This third year was all about boldness and connections. In the past, I had never signed up for a publisher appointment. I did not have any reason to do so because I did not have a book idea. All I had was this simple little blog that I never thought anyone else would even read when I started writing! This year I stepped out of my comfort zone, took a leap of faith and checked the box requesting a publisher appointment when I registered. It was something I decided to do during the conference last year. For these appointments, it is suggested that you bring a one sheet (one page telling about your book and yourself) and a book proposal (a detailed layout of your book idea, including a complete overview and sample chapters). In other words, a lot of prep work. I am not going to lie – I almost backed out of the appointments SO MANY TIMES! Between learning to navigate life with two littles under two, returning to work after maternity leave, getting this blog going again and having major surgery in May, I found it hard to focus on getting the prep work done (really, just getting started). Then there was that nagging problem of what I was going to write about. Since signing up for the publisher appointment in February, my mind had been all over the place. I could write about baby loss and grief. I could write about infertility. I could write about pregnancy after loss. I could write about depression and anxiety. I mulled over this all summer and then two weeks before the conference I knew without a doubt what this book had to be about. Two weeks, y’all. I quickly realized that there was no way I was going to have a full proposal, complete with sample chapters ready in two weeks. So I focused on a chapter outline and the one sheet, and after a lot of work wrote the introduction and a very rough draft of the first chapter. Needless to say, going into She Speaks, I felt very under-prepared. God gave me boldness while I was there. Boldness to speak my story. Boldness to talk about my book project without stumbling over my words. Boldness to strike up conversations with others. Boldness to just be me. 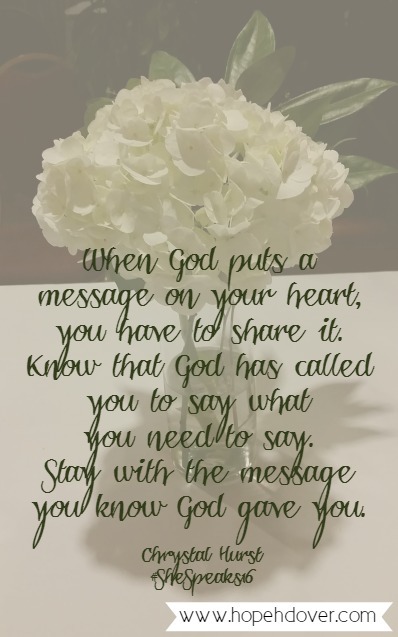 God has laid a message on my heart. It is a message for women pregnant after loss to know that they are not alone and that they can fight their fear in pregnancy with faith. This message will be received by those who need to hear it. I do not know the when or the how. 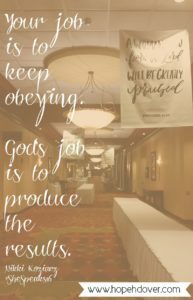 I just need to obey by getting it written and trust God with the details of getting it out there. Almost every message and talk I heard over the weekend confirmed this to me. 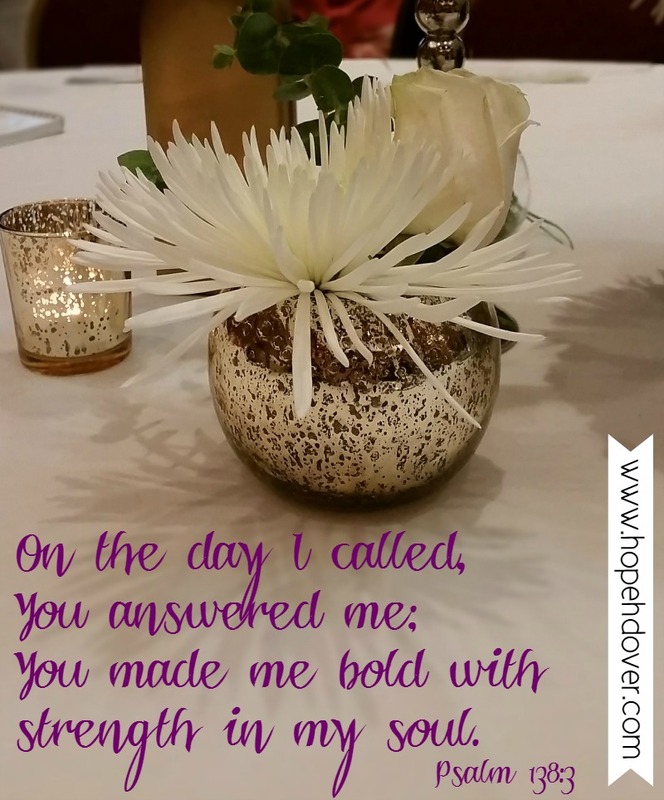 So, here I am boldly obeying and trusting God. It was an awesome weekend. I met some fabulous women, experienced God in a fresh way, rediscovered a confidence I haven’t had in a long time and “pitched” my first book to people in the biz. I am excited to see how God uses these experiences over the next year and look forward to what the next She Speaks holds. I’ll leave you with a few of my favorite quotes from the weekend. Until next time, keep hoping! I began writing about baby loss and infertility about seven months after we lost our first baby. It was so therapeutic for me to get it all out. 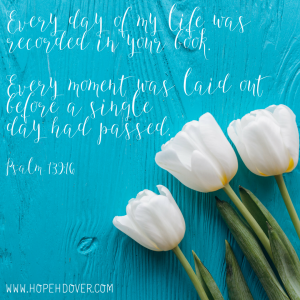 I was able to process so much of my grief through my blog. As people started reading and responding, they kept using two words to describe me. And every time I would hear one of these words attributed to me I would cringe. The words were brave and strong; and I hated them. I certainly did not want to be them. I didn’t want to be brave and strong if it meant I had to live without my babies. 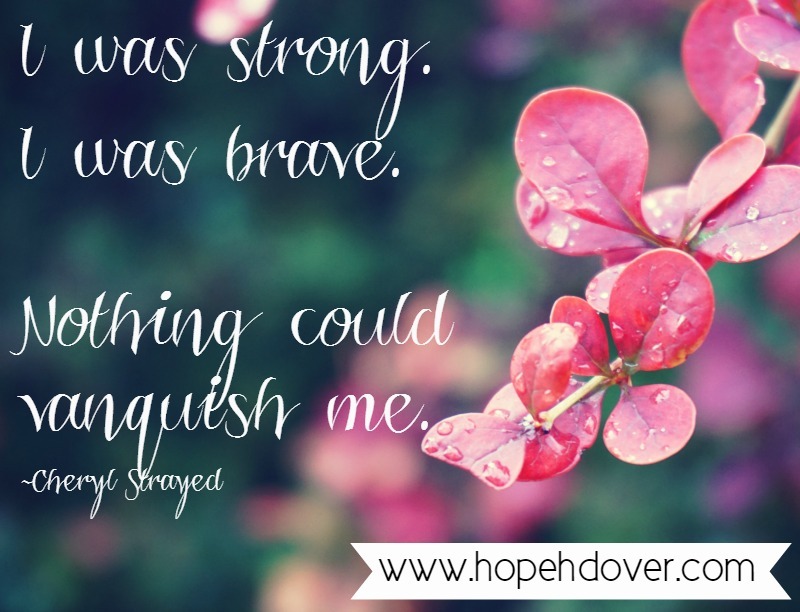 I didn’t want to be brave and strong if it meant I had to endure the struggle of infertility. I didn’t want to be brave and strong if it meant I had to live a life riddled with anxiety. I wanted my babies. I wanted to mother a living child. I wanted getting pregnant to be easy. I wanted to live without fear of bad things happening to me. I didn’t want to be brave and strong! Looking back, I can see that when people used these words they were meant to be a compliment. But in the middle of the storm, I could not see that. I saw these descriptors being used as a result of what happened and I did not want all of that stuff to be happening. I saw them as something people said because they did not know what to say. At the time, I did not feel brave or strong. So when I saw this onesie in Old Navy the other week, I had to buy it for Emma Joy. I have come a long way in my thinking and feeling about these descriptors. I have claimed them. I now wear them like a badge of honor. It is an honor to mother all four of my children. It is an honor to share my story and offer others hope. It is an honor to put it all out there, even the hard stuff. It is an honor to be on this journey. It is an honor to be brave and strong. I AM brave and I AM strong; but not because of what happened to me. I am brave and strong because of Christ in me. God commands us all to be brave and strong. Joshua 1:9 says, “Have I not commanded you? Be strong and courageous. Do not be afraid, do not be discouraged, for the Lord your God will be with you wherever you go.” Did you catch that last part? God is with us wherever we go, in whatever we face. That’s reason enough to be brave and strong. While the ways I am brave and strong have changed since I am no longer in the center of the storm, I know that I can face whatever stands before me with courage and strength because God is with me. What attributes are you claiming today? Be brave. Be strong. And until next time, keep hoping! I have learned over the past four years that grief is a tricky little devil. I can be perfectly fine one minute and have a tear-stained face the next. It can be all-consuming if I let it. There was a time in the not so distant past that grief exhausted every facet of my life. I was looking at the world through a lens of deep sadness. Some of the most beautiful moments were tainted by the tragedy of my past experiences. Even after I had Samuel, I was consumed by immense grief in the midst of immense happiness. It was a weird place to find myself. I would be holding this beloved child that God had given me, so thankful he was here, but at the same time grieving the fact that I had missed out on these precious moments twice. There were moments when I was able to simply enjoy him and enjoy being his mother. Amid these moments I would feel guilty for not missing or thinking of or grieving for my babies in heaven enough, as if there’s some quota on how much a bereaved mother should grieve or think of or miss her dead children. Then one day in late July as I sat in a crowded conference room at She Speaks waiting my turn to be anointed with oil (you can read about that here), God changed my heart. He showed me that I must not live in the past or feel bad about embracing the future without my babies. They are there and I am here. They are safe in the arms of Jesus. I can not do anything for them. They do not need me. I do have two babies, a husband, family and friends here who do need me. They need me fully present, not standing with one foot here and one foot there. They need me looking forward and not back. Does this mean I have forgotten about my sweet babies in heaven? No. They will never be forgotten. Does this mean that the amount of love I hold for them has lessened? No. The amount of love I have for them is immeasurable. Does this mean that my past is unimportant? No. Everything I have lived through has helped shape me into the person I am today. It does mean that my babies hold a sacred place in my heart. It means I don’t have to relive the hardest days so often. It means I am refined and not defined by what happened to me. It means I can enjoy the life I’m living now and look forward to the life God has for me in the future without feeling guilty. It means I can quietly remember them. It means I can believe in the promise of heaven and look forward to an eternity with all of my children. 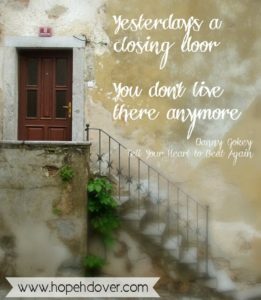 God does not intend for us to live in the past or dwell on negative experiences for too long. In Isaiah 43:18-19 He tells us to “Forget the former things; do not dwell on the past. See, I am doing a new thing! Now it springs up; do you not perceive it? I am making a way in the wilderness and streams in the wasteland.” That new thing that God is doing is not in the past. He is forging a way for us to move through past hurts and into the future that He has planned for us. In Philippians 3, Paul reminds us to press on, forget what is behind and strain toward what is ahead. We can not move forward by continually looking back at the past. We have to keep moving ahead. Looking back will only slow us down. If we believe the promise of Jeremiah 29:11 that God has a plan to prosper us, to give us hope and to give us a future, then there is no need to dwell on the past. He tells us in Ecclesiastes 3 that there is “a time to weep and a time to laugh, a time to mourn and a time to dance.” There has been a lot of weeping and mourning over the past four years and I know there will be more tears shed as I will never “get over” losing my babies. But I believe that right now it is my time to laugh and dance! My eyes still well up with tears at least once a day. Most of the time the tears come not because I am sad about the past, but because I am overwhelmed with God’s blessings of the present. Grief will still come and go, but I do not have to entertain it for too long. During these times I can remember with great love the two precious lives that changed mine forever. I can choose to let joy fill my heart instead of sadness. And I can rest in knowing full well that one day I will lavish all of my children with love. Oh, my prayer is for every woman who has lost a child to reach this point of looking forward. Exactly one year ago today we announced to the world that I was pregnant with Emma Joy. 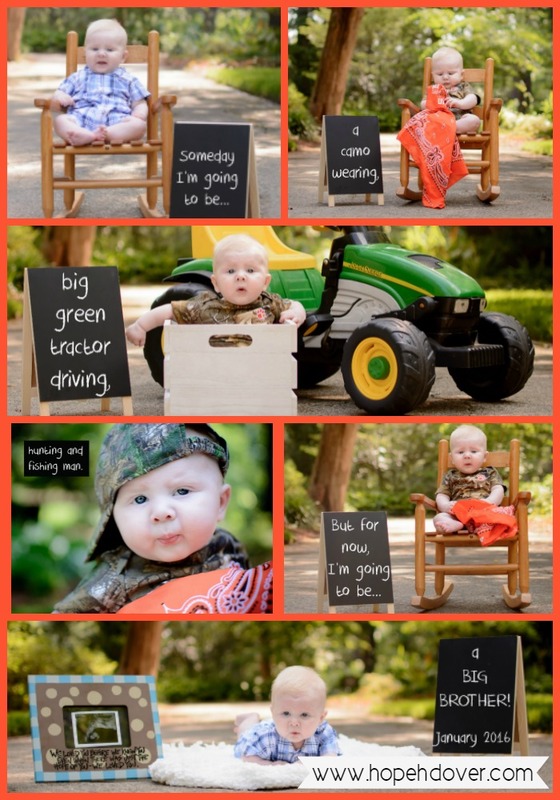 Someday I’m going to be a camo wearing, big green tractor driving, hunting and fishing man. But for now, I’m going to be…a big brother! Samuel was four months old at the time. My due date was two weeks before Samuel’s first birthday. 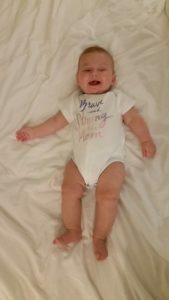 Throughout my pregnancy I heard one statement over and over again. You’re going to have your hands full! Every time someone would say this, I would smile and nod in agreement. In my head and in my heart I was saying, “not as full as they should be.” See, if all of my babies would have made it we would have a three-year-old, a two-year-old, a one-year-old and an infant. That thought makes me want to laugh and cry at the same time. It also helps keep things in perspective when motherhood gets hard. Emma Joy decided to come three weeks early, so they are one day shy of being exactly eleven months apart. It amazes me that my body endured two pregnancies and two deliveries in such a short period of time. Having back to back pregnancies after two losses and struggles with infertility is a huge endeavor, both physically and emotionally. Nevertheless, I would not have it any other way. When Samuel was born, I was fully prepared for him to be my only living child. We both knew that we would love more than anything to give him a sibling. We also knew that it was completely out of our hands. Before he was born, we decided that we would start trying for another baby fairly soon. We would give it a year and we would not undergo any fertility treatments. Our mindset was “if it is meant to be, it will be.” I was completely at peace with this. My prayer was one of thanksgiving for what we had and for God’s will for what was next. Pregnancy symptoms many times mimic PMS symptoms. I knew this all too well. So, when I started having pregnancy symptoms a few weeks after Samuel turned three months old, we both just laughed. I mean, we weren’t even really trying yet, for goodness sake. This seemed like the real deal though, but I did not let Keith know that. I even waited a little longer than usual to take the pregnancy test. When I showed him those two pink lines, the look on his face is one I will never forget. This sweet baby girl brought joy from the moment we knew about her. People still tell me all the time about how full my hands are, as if I need to be reminded. My days are filled with diapers and bottles and laundry and crying and laughing and chasing and playing and hugging and saying “Mama loves you so much” more times than I can count (they’re going to know that for sure). Yes, my hands are full. But, oh, you should see my heart. My heart is absolutely overflowing. It is overflowing with so much love for all of my children, those here and those in heaven. It is overflowing with a new love and appreciation for my husband who is the best Daddy these babies could have. It is overflowing with thanksgiving for everything God has done in my life and everything I have overcome through Christ’s strength. It is overflowing with hopes and dreams, some big and some small. I don’t mind my hands being full if it means my heart gets to feel this way.